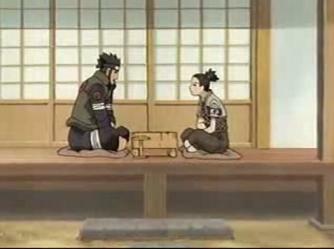 Naruto Shippuuden 77 has shogi scenes which are approximately 3 minutes. Here are some snapshots. The conversation between Asuma and Shikamaru is about Bogin(Climbing Silver) strategy. They are talking that Bogin is an sacrificing advance party when breaking through the enemy's formation. Does this have anything to do with the destiny of these two guys? The second snapshot is a bit peculiar to us who are somewhat familiar with shogi. Bogin(Climbing Silver) is a strategy of Ibisha using one's right Silver which aims at breaking though the head of his Rook. But the position shows that a King in Mino castle is in check of Silver. 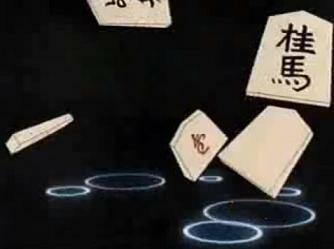 I don't think Kishimoto or the animator know shogi very well. But anyway, Naruto is a very popular anime not only in Japan but also verious countries. 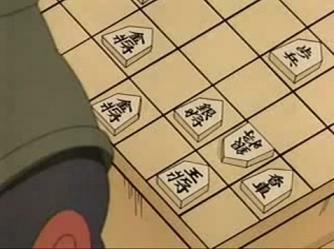 I hope lots of Naruto fans will get interested in shogi through the scenes like this episode. The title of this Episode is 棒銀(Bogin = Climbing Silver). Climbing Silver is one of the most popular strategies in shogi among from beginners to professional players. Here are some links about Climbing Silver. Shogi Atlas --- it has three headlined pages including "Climbing Silver"
I like Naruto episode.I have seen Naruto Shippuuden 77.shogi scene was interesting.Know i have became the fan of shogi.Naurto is playing get role for spreading shogi among countries.